"The stone can migrate to more unusual areas, such as the region of the iliopsoas." From an article on postoperative abdominal complications. But I picture a smooth, round-bodied creature, an outcast of a tranquil race of people, joining an island colony in a tropical haven. Over a week ago I received a surprise package in the mail. 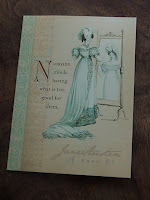 Enclosed was this card with its lovely sentiment: "Nobody minds having what is too good for them." The tides are turning in my favour these days. I don't mind, exactly, but I do wonder sometimes when they might turn the other way, not that I think I don't deserve good things but because they seem to be governed by forces beyond my control. In that package was a book qualifying as good for me. Whining and Dining: Mealtime Survival for Picky Eaters and the Families Who Love Them strikes me as a pretty smart and basic resource; with over 100 easy recipes (Martian soup! ), it includes recipe substitutions, general tips for enticing kids to eat what's good for them, and helpful not-always-as-obvious-as-you'd-think-it-should-be advice like pour out the kid's portion before you add spoonfuls of grated ginger for the benefit of flavour-adventurous adults. I even tried a recipe for some cheese-poofy things last week and met with relative success. Ironically, the girl is pretty easy to "cook" for — she's never met a fresh vegetable she didn't like (excepting those days one just doesn't feel like having green peppers); if anyone's a picky eater here, it's J-F (but don't tell him I said so). So far as I can tell, they're all excellent. Work first, reward (read: reading frenzy) soon. 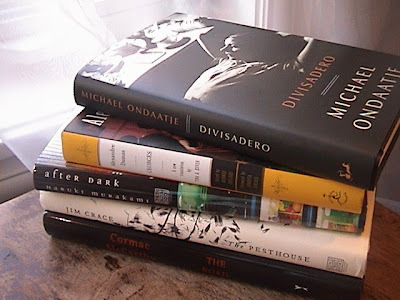 Already Ondaatje's Divisadero is serving as an occasional langourous respite. Nothing's too good for me. Helena says her drawing is of a spectacle, putting herself on the stage and describing the view, reminiscent of Harold's purple-crayon audience at the circus. One hundred thousand words, not yet fully edited, with several deadlines for various pieces of it at different stages of production over the next week. And it's about suicide, a topic of vital importance, blah, blah, blah, but one that's not exactly, umm, uplifting. For various reasons — family obligations, suboptimal planning, and events relating to the situation outlined in Panic, work-related, II (see below) — I'm behind schedule. Recently, I was offered a position of full-time employment, doing something I am perfectly suited to doing for a decent salary and at a convenient downtown location. And I accepted it. I start in a couple weeks. Life as I now it is about to transform into a very different kind of beast. 1. What do you mean I can't set my own hours, get around to working when I feel like it? What do you mean I can't wear my pyjamas or pyjama-like loungewear. What do you mean this doesn't seem like a good time to up and take a walk around the neighbourhood? But I wanted this, asked for it, and got it. Now to deal with it. And purchase some respectable officewear, of the sort I've not needed or worn in 5 years. 2. I have never before had a job and a child at the same time. The logistics of it are daunting. I have to remind myself that there are millions of families with children where both parents work outside the home, that millions of people manage to have jobs, and kids, and regular lives. I have to keep reminding myself of that or I stop breathing. As difficult as it seems, millions of people actually do it — how bone-crushingly, brain-suckingly hard can it be? 3. I'm not sure what the third element of this panic is, but I'm sure there is one. Likely something to do with the precise nature of the work itself. Frankly, I've been so consumed with my current contract and with the panic concerning it, that I've had little time or energy to formulate a full response, emotional or logical, to this job offer and its implications even a week after the fact. Nor has it been properly celebrated. Yet. For the time-being, blogging will be light and sporadic, or possibly voluminous and angst-ridden, serving as either procrastination or therapy or both. I remind myself that millions, no, but at least tens of people with jobs and children and regular lives manage to maintain interesting blogs. Maybe I can be one of them. Did I brush my teeth today? What are we having for dinner? I desperately need a haircut. I wonder how The Messiah of Stockholm ends. Pierre Foglia notices the chains. First in the book he was reading, We Need to Talk about Kevin, by Lionel Shriver. Then in the world, on a Virginia campus on Monday. C'était la première fois qu'un tueur de campus — il y en a eu plus d'une douzaine au cours des 10 dernières années, la première fois, dans ce roman, qu'un tueur pensait à fermer les portes du lieu du massacre avec une chaîne. La deuxième fois c'était à Blacksburg hier. Une coïncidence, c'est sûr. Mais si ce ne devait pas en être une, ce ne serait pas la première fois que la fiction nourrirait la réalité. The Guardian books blog toasts Patrick Hamilton. Hamilton is coming back into favour, and his books are coming back into print. The Gorse Trilogy, as I previously noted, is set to be published in June by Black Spring Press. Finally I can read the third book and know how it all ends. While the Gorse trilogy is not exactly Hamilton's magnum opus (especially the drink-soaked Unknown Assailant), it does demonstrate his handy knack for both literature and drama and we can all raise a glass to its reissue, something I fear the man "who needed whisky like a car needed petrol" and died of multiple organ failure would approve no doubt. I know you’re very busy, Mr. Harper. We’re all busy. Meditating monks in their cells are busy. That’s adult life, filled to the ceiling with things that need doing. (It seems only children and the elderly aren’t plagued by lack of time — and notice how they enjoy their books, how their lives fill their eyes.) But every person has a space next to where they sleep, whether a patch of pavement or a fine bedside table. In that space, at night, a book can glow. And in those moments of docile wakefulness, when we begin to let go of the day, then is the perfect time to pick up a book and be someone else, somewhere else, for a few minutes, a few pages, before we fall asleep. Yann Martel asks, "What is Stephen Harper reading?" Martel vows to send Prime Minister Harper a book "known to expand stillness," every 2 weeks, documenting the books and any response on the website devoted to the project. Book 1: The Death of Ivan Ilych, by Leo Tolstoy. While the merits of the project may be questionable, the above-quoted sentiments couldn't be truer. After a particularly stressful meeting last week, I popped into a used bookstore to destress before heading home. I hesitated over a copy of Bruno Schulz's Sanatorium under the Hourglass but turned it down because it smelled funny — I mean, really funny; but I came out with a gem, The Victorian Chaise Longue, by Marghanita Laski (1953). It's been reissued recently by Persephone Books, and I've heard wonderful things about it in various corners of le bloguemonde (from Danielle, among others). While the recommendations were strong, the cover art on the 1960 paperback I found is irresistible. Are you fond of old-fashioned furniture? Furniture is inanimate — but it is occupied by animate beings subject to fear, love, despair, hatred, happiness — the myriad feelings of which humans are capable. And who knows what the life-span of terror may be? Who can tell what identity one may find woven into a plush old velvet chaise-longue, or what determines the time and setting for acting out a drama of horror? Be careful. Your antique bargain may be a sink of malignancy. I paid about 5 times the 35-cent price boasted on the spine; still a bargain, but this prospect of malignancy has me a bit concerned. In the morning he read. This meant that he started on the first page and finished on the last. He was not a skimmer or a sniffer; he read meticulously, as if, swimming, he were being filmed in slow motion. The text swept him away and consumed him — he was like a man (the man in the bedclothes in his father's tale) drawn down by an undertow. Slowly, slowly, the imaginary cinema recorded his heavy resisting gulps. Reading was as exhausting to him as the long, weighted strokes of a drowning man. He gave it all his power. Then he cooked himself a bowl of farina and fell into the wilderness of his quilt. When he woke at seven into full blackness of night, he felt oddly fat — he was sated with his idea, he understood what he thought. He sat down immediately to his review. He wrote it straight off, a furnace burning fat. It was as if his pen, sputtering along the line of rapid letters it ignited, flung out haloes of hot grease. The air brightened, than charred. He was very quick now, he was encyclopedic, he was in a crisis of inundation. He drove through all the caged hypotheses of his author — some were overt and paced behind bars, others were camouflaged, dappled; he was a dervish, he penetrated everything. When he was within sight of conquest he began to fuzz over with vertigo; he was a little frightened of all he knew. A greased beak tore him off his accustomed ledge and brought him to a high place beyond his control. Something happened in him while he slept. It was not the sleep of refreshment or restoration. He had no dreams. Afterward his lids clicked open like a marionette's and he saw: what he saw, before he had formulated even a word of it, was his finished work. He saw it as a kind of vessel, curved, polished, hollowed out. In its cup lay an alabaster egg with a single glittering spot; no, not an egg; a globe, marvelously round. An eye. A human eye: his own; and then not his own. His father's murdered eye. He is Lars Andemening (fictional), book reviewer for a Stockholm newspaper. His father, allegedly, is the Polish writer Bruno Schulz (historical). The book is The Messiah of Stockholm, by Cynthia Ozick, The Messiah being the legendary novel Schulz had reportedly been working on before he was shot by Nazis in 1942, no trace of which was ever found. 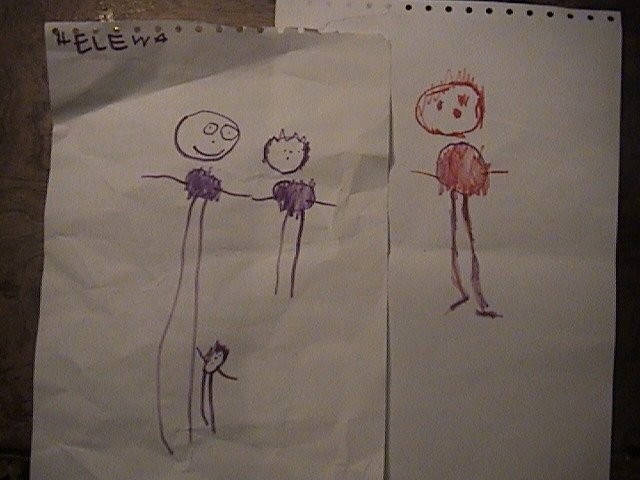 Family, left; Mommy (that would be me), right. By Helena. 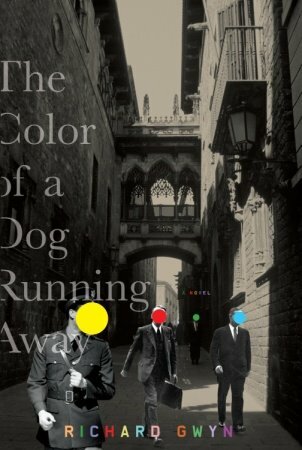 Regarding the title: "In the language here this idiom refers to something of an indeterminate or vague and shadowy appearance, perhaps suggesting a fugitive reality" ("here" being Barcelona). The book reads like a dream. That is, it has a dreamlike quality. It's a novel the way "Colourless green ideas sleep furiously" is a sentence. All the components are there, and they're awesome, yet they add up to something quite other (certainly not less, but I hesitate to say more — other, like a magic trick) than the sum of the parts. The components are disparate, pulled out of a hat. Barcelona herself is prominently featured, with her unique history, architecture, and myths. Enter a femme fatale. An air of conspiracy. An expat community that inhales alcohol and drugs faster than Lucas's neighbour's rabbits breed. "It's like a detective story," she said. "But in fact it contains only one element of mystery. The rest of it is simply boy meets girl. What you are trying to do is link the mysterious element with non-mysterious element in order to make your meeting with this girl appear utterly synchronistic, a meaningful coincidence. Or somehow preordained. Which of course it might be. But not necessarily in the way you think it is." Of course, it's harder to maintain this cool-headed perspective as the mysterious elements pile up on top of each other. Add a mythic group of roof-dwellers who never touch ground. (They're said to steal babies.) A megalomaniacal cult leader intent on reviving Catharism. A fire-eating prophet. A baron with a tower that served as a gaol during the Inquisition. It would seem that they provide something for their owners to stroke, to be comforted by, and to speak to. However, it is untrue that cats are diabolical. They simply unsettle people by the ease with which they snub affectionate advances, and inspire jealousy in the relaxed and libidinous lifestyles that they pursue amid the toiling masses of humanity. Nuria, the femme fatale of the story, often has feline qualities attributed to her. When a "witch" gives her "a shell the size of a small cat," Nuria breaks it, and the story and all its characters seem to unhinge. There's something about the cat. It's saying something about Nuria, or about love. Something. The novel drifts from one aspect to another fluidly, operating by its own internal dream logic. Farfetched, but somehow normalized. An awful lot happens, yet at the same time it feels like nothing at all. There are no tidy endings here, but it's written deftly, such that I feel the loose ends are left lying exactly where they ought to be. I rather like my endings ambiguous; they give bad novels the opportunity for me to forgive them and they keep good novels from ending at all. The Color of a Dog Running Away is sleeping furiously. Richard Gwyn on Barcelona and how the city helped shape the book. Dan Rhodes lists his top 10 short novels, all under 200 pages. "All killer, no filler." (I've read, and loved, half of them.) Perhaps the novella is due for a comeback. On the list: The Plains of Cement, by Patrick Hamilton. "The Plains of Cement is brilliantly excruciating — Hamilton tortures his characters, the reader and, I expect, himself. He's the best pub writer I know." The Plains of Cement is the last book, and my favourite, in the trilogy published as Twenty Thousand Streets Under the Sky. I've quoted from it here, and then discussed it a bit further. As for short books, I like them. Long is good too. Both have their time and their place. Short has the advantage of slipping into my bag easily. For this reason this morning in my travels across the city I started reading Cynthia Ozick's The Messiah of Stockholm — I'm loving it already and can see it claiming a position on my own list of best short books. What short novels are your favourites? The 9th Blue Metropolis Montreal International Literary Festival takes place April 25-29, 2007. This year's theme: free spirits. Margaret Atwood is to be honoured with the 2007 Blue Metropolis International Literary Grand Prix. I'll be pressed for time because of my work deadlines, but I hope to squeeze in an event or two. How to choose? Hours spent in a car between Friday midmorning and Monday evening: about 17, or way too many. Hours of sleep: quite possibly more than usual, but so restless as to entirely discount any benefits. Hockey games closely monitored this weekend: 3. Unhappy Habs fan in the household: the man I sleep with. Unhappy Leafs fan in the household: my brother. Mother who insists on over-exerting herself even though she's still recovering from a hernia operation: present and accounted for, apparently not to be stopped. Books received: The Slaves of Solitude, Patrick Hamilton. A copy of my very own! My sister had found 2 different editions for me to choose between, so I read the introductions to both. David Lodge gives an excellent character analysis in the recent NYRB Classics edition, but I chose the Constable edition, which has 2 introductions (one by Doris Lessing, one by Michael Holroyd), providing a little bit more biographical detail and generally more enthusiasm. Also, I like the cover better. Pages read while away: about one a day (not counting the aforementioned introductions), leaving me to finish my so-close-to-finished-that-I-brought-a-backup novel only on returning to the peace and quiet — the normalcy — of home. Number of bookstores visited amid a flurry of other activity and in a hurry to do so before closing time, which involved selfishly abandoning a tired and cranky girl to relatives: 4, 2 of them being used bookstores, where my inquiries after Patrick Hamilton were met with, "Never heard of him." Books purchased: The Purity of Blood, Arturo Perez-Reverte. There will be swordplay. Oh, yes. Books retrieved from my mother's basement: a nicely illustrated volume from Dandelion Library containing abridged versions of both Alice in Wonderland and Peter Pan. While I recall the book's existence during my childhood, I do not remember reading or being read to from this book, nor do I associate these stories with my childhood. I came to appreciate Alice much later in life; I don't believe I've ever read Peter Pan. Movies watched in their entirety: none, but I would really like to know how The Machinist ends. Movie received as gift: Rope (Alfred Hitchcock; based on the play by Patrick Hamilton, hence my recent interest in it). Amount of chocolate consumed: not nearly as much as I'd anticipated. Number of wine bottles emptied: 5? 6, 7? Who's counting? The big takeaway, my mother's implied criticism of me in a general discussion: I am a horrible mother for not teaching my daughter to speak Polish. Number of words to be copyedited by the end of the month: 100 000, give or take. Amount of progress made thus far: very little. Jobs regarding which I have meetings this week: 3. Rocks I'd like to crawl under: yes, please. This book: A Canticle for Leibowitz, by Walter M Miller Jr. Very cool. Have I mentioned? We're suckers for a postapocalyptic tale in this household. (No, I haven't read The Road yet, though I've been wanting to, and now I feel fully primed.) Add to the mix a monastery with all the politics entailed therein, bands of mutants wandering the landscape, and an Immaculate Conception — I am so there. As I mentioned previously, I've been meaning to read this book forever, so when I learned it was being reissued I jumped at the offer of a review copy. I did manage to finish reading it last weekend, but I'm afraid I haven't many deep insights to share (I'm busy and tired). It's not a masterpiece of prose, but that's OK — it's a novel of ideas, some mind-bending and enduring ones. It's nearly 50 years old (written in 1959) and it's still relevant. The first part is set approximately 600 years from now. (The second section jumps another 600 years ahead, and the third takes place some 600 years after that.) The world is barely starting to recover from nuclear devastation and the resulting "simplification" (a kind of uprising by the masses to overthrow the political authorities but also technology for the destruction they've wrought, a backlash against progress), and while such a threat no longer seems as imminent as during the Cold War, the implications are still worth considering. (The second and third parts respectively cover something like an age of enlightenment or industrial revolution and then a space age.) All the sections centre around the goings on of a monastery founded by Leibowitz, who is later canonized. Who Leibowitz is is largely irrelevant, a minor revolutionary really and an engineer whose documents survived the Flame Deluge. One of the major concerns is the preservation of knowledge. The politics of the abbey come into play: who is best suited to preserve knowledge, who has the right to access it, who is equipped to interpret it. Advocates! Excommunications! (For these reasons I'm reminded quite a bit of The Name of the Rose, even though their stories, apart from the monastic setting, may not seem to have much in common at all, but A Canticle is much more accessible.) Of course, the preserved documents and other memorabilia are barely "knowledge" at all, mostly indecipherable information, but from these scraps civilization will rebuild itself. The 3 sections were in slightly different forms published independently and later reworked to form a novel. And because of the vast time period covered, any attachment formed to a character must be broken. It's the monastery that's the touchstone, and it's rich with the symbols and (metaphorical) ghosts of its residents. This line of questioning was puzzling to Brother Francis. In his own mind, there was no neat straight line separating the Natural from the Supernatural order, but rather, an intermediate twilight zone. There were things that were clearly natural, and there were Things that were clearly supernatural, but between these extremes was a region of confusion (his own) — the preternatural — where things made of mere earth, air, fire, or water tended to behave disturbingly like Things. For Brother Francis, this region included whatever he could see but not understand. And Brother Francis was never "sure beyond a doubt," as the abbot was asking him to be, that he properly understood much of anything. Thus, by raising the question at all, Abbot Arkos was unwittingly throwing the novice's pilgrim into the twilight region, into the same perspective as the old man's first appearance as a legless black strip that wriggled in the midst of a lake of heat illusion on the trail, into the same perspective as he had occupied momentarily when the novice's world had contracted until it contained nothing but a hand offering him a particle of food. If some creature more-than-human chose to disguise itself as human, how was he to penetrate its disguise, or suspect there was one? If such a creature did not wish to be suspected, would it not remember to cast a shadow, leave footprints, eat bread and cheese? Might it not chew spice-leaf, spit at a lizard, and remember to imitate the reaction of a mortal who forgot to put on his sandals before stepping on hot ground? Francis was not prepared to estimate the intelligence or ingenuity of hellish or heavenly beings, or to guess the extent of their histrionic abilities, although he assumed such creatures to be either hellishly or divinely clever. The abbot, by raising the question at all, had formulated the nature of Brother Francis' answer, which was: to entertain the question itself, although he had not previously done so. Miller witnessed the destruction of the monastery at Monte Cassino during World War II, and this allegedly served as inspiration for the novel. This also strikes a personal chord with me, as both my father and my mother's father were there; I wonder if they ever stepped outside of their brutal, personal experience and considered the vaster implications. I am stunned that no one has attempted to film this novel. Miller shot himself in 1996. 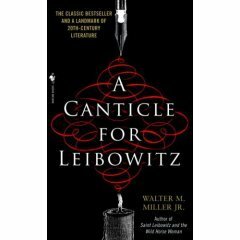 He'd written most of another "canticle," Saint Leibowitz and the Wild Horse Woman (an excerpt of which is included in my edition but which I've not yet read). 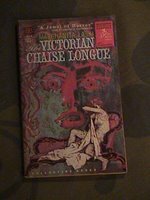 It was published posthumously, the writing finished by Terry Bisson. I wish I'd read this as a teenager. I'd be zipping through school hallways telling all my friends I'd just read the coolest book ever. It strikes me as a great book for teens, one of those first "adult" books, accessible but provocative. This is not to say it's any way juvenile — it's a good read for anybody, and deserves to be called a classic. The polling station for our provincial election last week was located in the gymnasium of the primary school at the end of our street. In the late afternoon, all 3 us went together. As we approached the door, Helena gripped my hand tight and confided in me, "I feel a little bit shy." I'd explained where we were going and why, but obviously the why of it didn't make a dent in her excitement to be entering this grand — to her eyes — building. She expressed some confusion once inside, but no real disappointment. She was delighted to discover a row of drinking fountains, all her size. Those few moments for me, though, caused months' long emotional turmoil to resurface. No parenting issue had caused me tears like this one, when in fact there is not an issue, no problem to solve, only the facts to deal with. Helena will not be starting kindergarten in September. Not because she's not ready, or willing; because she's not old enough. And this riles me. Maybe because I was already in junior kindergarten when I was her age now; she will be an academic year behind where I was at her age. Our birthdays are in November, a day apart. But whereas the cutoff for school entry age in my home province is December 31, it is September 30 in the province we live in now. Part of me wonders about the different life we'd be leading if we'd stayed put, not moved here when I was pregnant. It pains me that the distance of a 2-hour drive costs Helena an academic year. It's inevitable: someone will always be oldest and someone will always be youngest in every class, no matter where the entry age dates are fixed. I was one of the youngest. Perhaps this contributed to the perception, mine as well as of others, that I was bright, ambitious. In retrospect, I can't say it served me particularly well — I would've done better to delay university by a year or two, even more. But Helena will be one of the oldest, and it bothers me no end. There are several other November birthdays in her current daycare class. I find it strange that none of those parents are bothered; they're very matter-of-fact, it's a matter of fact. 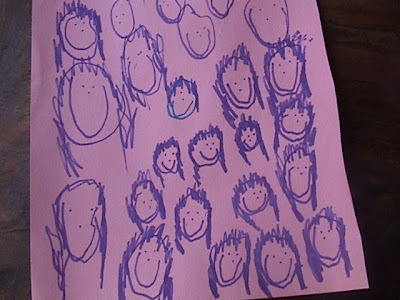 It galls me to know that Helena's "cousin" is already nearing the end of her kindergarten year. She is only 14 months older (barely more than a year!) than Helena but scholastically a full 2 years ahead. Pesky cutoff dates. More than anything, I'm surprised. Simply, I thought she'd be in school by now. This idea has been reinforced in countless ways. I hear about how important early education is, that children are untapped potential, sponges. It's counterintuitive that school should start so late. Of course, the early years are important for emotional and social development too; but I fail to see what difference an additional year at home or in daycare might make for the child who is not, by age, say, 4, already emotionally well adjusted and in a nurturing environment. Daycare, or community activities, is all very well for socialization, but children are fully equipped to be learning more than sharing, dancing, or colouring. There's so much more to gain at this age by going to school. I don't want to be a pushy mom, a stage mom or hockey dad. I don't think I will be. If anything, I could use a little more pushy in my life, and would do well to set a more assertive example for Helena. While I think Helena's smarter than your average bear, I don't claim that she's developmentally a year ahead of her daycare peers. There's plenty of time for competitiveness to rear its ugly head on Helena's own shoulder without my interference this early in the game. I considered filing for a derogation for Helena. Exceptions to the rule can be made, but anecdotally they're very rare (we don't know anybody who knows anybody who's heard of anybody...). The application requires that the child undergo a thorough psychological evaluation. (J-F is dead set against putting Helena through such a process.) It must be shown not only that the child is ready for school, but that the child would suffer unduly by not attending school at an earlier age. Weighed against staying with her peer group in a good daycare (and she would — will — stay happily, not knowing what she's missing), how does one measure the loss? I can't help but feel I should be doing something more, that Helena should have more, that this is all very wrong. Junior kindergarten is uncommon here. I am grateful that her daycare is more pedagogically focussed than many. Private school is not an option (nor is homeschooling). Financial concerns aside, I back the principle of a public school system. What's driven home hard to me is how desperately I need to step up. Somehow. Helena lately wants me to play school with her, so I do, regularly; we practice printing letters, she's warming up to reading, she has a facility with numbers, basic arithmetic. But I'm a mom, not a teacher; I haven't a clue how to proceed. For all the good my "early" education did me, I've learned only that "me" in the parenting equation has produced an infinite not-good-enough, a sequence of fuckups. I'm tired of crying over this. I'm overwhelmed by the irony, that the one most fundamental, to my mind, aspect of a person's life — an education — the thing a parent is most responsible for managing, is the one I feel I have the least control over and most inadequate to provide. I'm sincerely interested to know your opinions and your experience. What is the school entry age, and the cutoff date, where you live? Do you have any structured learning time with your child, and just how structured is it? When should children start school?